It has been so long since I contribute to the weekend herb blogging at Kalyn’s (I got to her blog and found her blogging on the same herb this week, how coincidence!). This time I decide to add in my entry on Chinese parsley (pictured above as garnish). This herb surprisingly has various names referring to it, where last year, without the world of blogging to expose me, I would be totally lost. It is also known as coriander leaves, cilantro and dhania in other parts of the world. It was once pretty confusing when I see it mention in foreign recipes and I had to research up on it. As for its uses, it is usually used for garnish as it will loose its flavours quickly with heat. But this time, as per recipe I would be cooking it slightly at the end and then garnish it with more parsley. This dish also features a lot on the limau purut (kaffir lime leaves) which I had blog before on of those long-time-ago herb blogging. 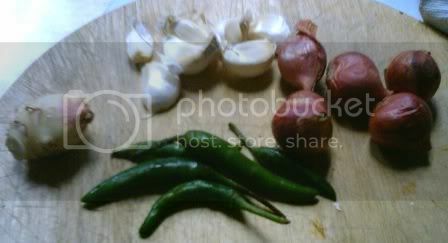 This time I am making a dish from the Thai cuisine. Thai is one of my favourite Asian cuisines, apart from Chinese and Indian, and also not to mention Vietnam. Thai is famous for its sweet, sour and spicy cuisine, complex in taste yet light on the palate. I remembered having this dish before but I cannot recall where. Nevertheless, I know it would be good, as reading the ingredients made my mouth water. This dish can be chow (fried) with other meats such as chicken or beef but this time I am using prawns, since Tesco is having a huge sale on prawns, and it seem to be more authentic this way. 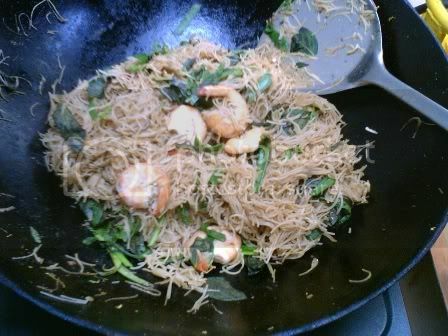 Then of course there must be the fish sauce, which is the main flavouring agent in this dish. You can also substitute it with soy sauce, if you don’t have it. Oh ya, I wanted to get glass noodles for this, but I cannot seem to find it in Tesco, thus I bought brown rice vermicelli instead, just for the sake of nutrition, hence the darker looking Pad Thai. 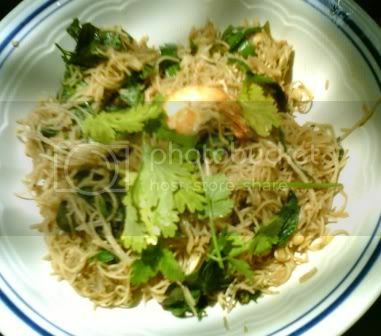 Since this recipe have many variations, and you can add many ingredients or omit them, I would list down the alternatives too and do take note everything is in estimation, after all, this is done with Asian cooking style (if you don’t know what style, it is the dump, fry and taste style). Enjoy. Remove the parts of the prawns that you do not like, I left on the shell and tail plus half the head, legs removed of course. Then heat up the wok in about 3 tablespoons of oil. Throw in you paste and fry briskly, till the aroma is all over your kitchen. Off the fire, dish up and serve, garnish with chopped peanuts and more parsley and a lime wedge if needed.